Sunshine and warmth may be greeted with almost mythic awe in this country, but really we have no need to be surprised when the weather warms up. It happens every year and when it does, it is a priority to keep passengers cool and comfortable. It is now getting to that period when temperatures start to rise and air conditioning systems come into their own, or at least that is the plan. In some cases, the ‘on’ switch is pressed and we find the systems are not functioning to their maximum capacity or are just not working at all. One of the most common problems with air conditioning systems, according to JAVAC’s Dave Kingston, is loss of refrigerant. The less there is in the system, the lower its cooling capacity. Instead of waiting till the required temperature for the air conditioning to work is met to find out if there are any problems, he suggests carefully warming the sensor to ensure the system is still working properly on a regular basis. Dave also highlighted that there is also a lot more ‘shaking’ on board buses and coaches than there is in cars. This can often ‘find the weaknesses in the systems’ and can cause seepages. The refrigerant is often not hermetically sealed either, which again means that movement from the vehicle can cause leakages over time. He claims one of the biggest problems is that because the systems’ compressors do not often run in winter, the seals can become dry. The seals rely on being oiled to work properly, so if it does become dry, vibrations will cause refrigerant to seep away. Dave said this country is ‘the enemy of air conditioning systems’, claiming the climate is just not ideal for them when it comes to maintenance. Grayson Thermal System’s Area Sales Manager for Southern England and South Wales, Coleen Williams, certainly agrees with the idea of regularly running air conditioning systems, even in winter when they are not otherwise in use. She also highlighted the importance of basic regular maintenance, such as cleaning filters. She said the most common reason for failure is poor maintenance. When it comes to the regular servicing of air conditioning systems, Autoclimate has the tools for the job. It has the Robinair AC790Pro refrigerant management station. The unit automatically controls the recovery, recycling, vacuum and recharging processes for refrigerant. The system incorporates a powerful vacuum pump and compressor, greater capacity refrigerant tank and oil bottles together with a higher power charge, compared with most such units in order to cope with bigger vehicles. Its large twin fan cooled condenser is designed to ensure excellent temperature and constant coolant pressure during recovery which prevents internal components from overheating. The built in printer provides reports showing the vehicle identity, date and time of the service, refrigerant recovered and charged, oil recovered and charged, vacuum time and whether it passed the vacuum leak test. Autoclimate offers helpdesk support for any equipment in the Robinair range, backed up by a nationwide network of service engineers. JAVAC supplies air conditioning servicing systems. For the bus and coach market it has the Texa 760R BUS, specifically designed to recharge refrigerant on buses and coaches. It is equipped with a high visibility colour TFT display with a graphic interface for ease of use. The service management procedure is fully automatic, meaning there is no requirement for manual taps. It has a hermetically sealed bottle system, automatic service management capabilities and refrigerant measurement and scale locking functions, as well as having a 30kg internal storage tank, a larger 21cc compressor for refrigerant and a dual stage vacuum pump. 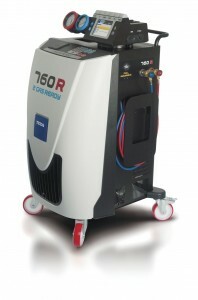 The 760R BUS can be configured either for the old R134a refrigerant or the new R1234yf. A retrofit kit is also available to change the refrigerant type it can deal with. Optionally, it can be supplied with a thermal printer, a vehicle flushing kit, a climate efficiency kit and a refrigerant identifier system. Key to ensuring air conditioning systems are running at their best is to source the right parts for them. THHS would be one of the best places to look for this, as the company supplies heating, air conditioning and ventilation parts for various applications. According to the company’s Dave Miles, all brands are catered for. The family run business’s aim is to provide the best service, advice and products. It has an extensive online catalogue. Also offering an extensive array of air conditioning system parts from numerous brands is Airconco. In particular, the company specialises in Eberspächer systems, being the manufacturer’s representative in the north of England. It is based in Heywood, Lancashire, having recently moved into new premises there. The new site means its entire business, from parts supply to servicing, is now all based in the one building. There have been a number of developments at Webasto in the past few years, including the acquisition of Diavia in 2012. This added a new portfolio of light weight products to the company’s range for installation on any vehicle in a variety of positions, including under the dashboard, in the roof or vertically on a sidewall. Webasto will be at the Commercial Vehicle Show at the NEC in Birmingham from 29 April till 1 May (Hall5, stand 5D120). It will be showing its Vancouver integrated air conditioning system for installation under the dash or roof. This has a cooling capacity of up to 9.5kW and is suitable for minibuses seating up to 15. Utilising the R134a refrigerant, this unit runs on a rated voltage of 12v or 24v. For larger minibuses with up to 25 seats, Webasto has the Moscow integrated air conditioning system. The solution can be installed either under the dash or roof. The high efficiency fans and blowers should ensure the solution is reliable and efficient. 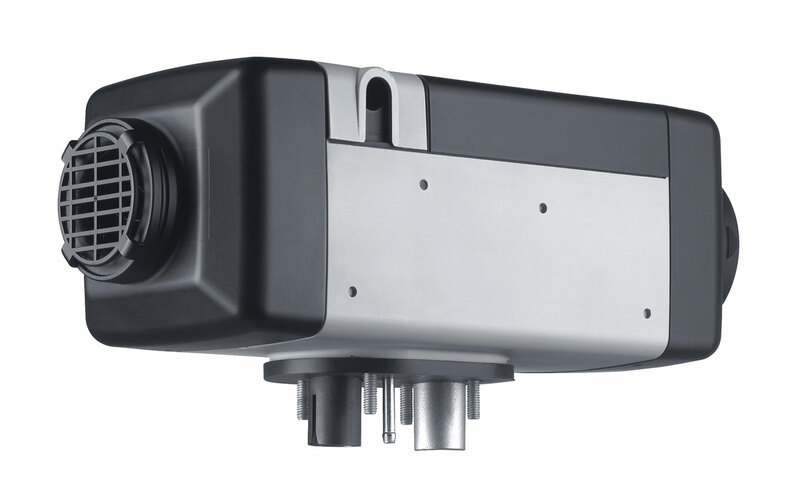 It has a constant air flow and cooling capacity of up to 13.4kW and a rated voltage of 12v or 24v. Additionally, Webasto is to show its range of engine pre-heating and heating devices, as well as Air Top 2000 ST air heater ‘One touch’ Climate Control system and the compact SMART controller. 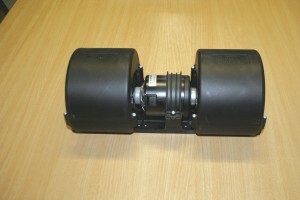 The company has a range of products covering all bus and coach applications. 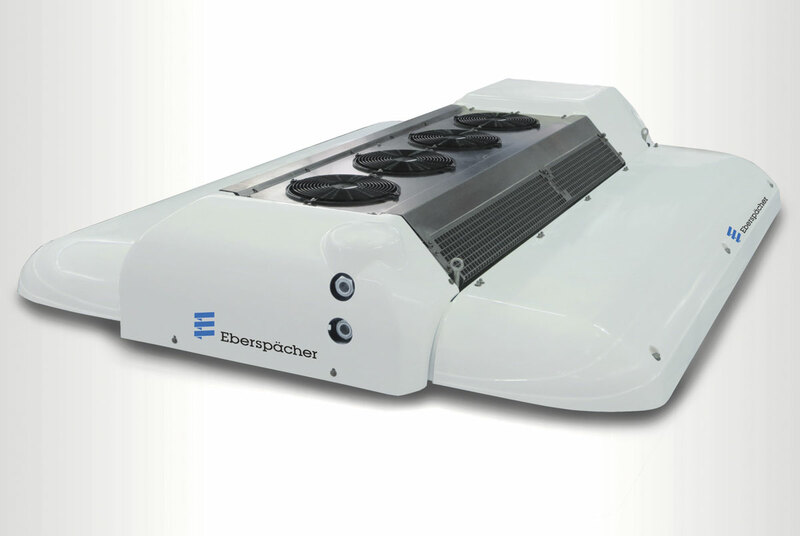 Eberspächer continues to expand in the bus and coach industry, with one of the latest advances being the new EV and HV ranges of modular air conditioning climate control units. It has also introduced new easier to use control panels. Its extensive range for bus and coach applications includes Hydronic heaters, which have outputs of from 1.5kW all the way to 35kW. The company’s Airtronic system has a similar output range. Busworld in Kortrijk saw the launch of Eberspächer’s AC 136 AE electric bus air conditioning system with integrated heat pump. Depending on demand and outside temperature, the AC 136 AE heat pump either cools or heats the passenger compartment. The technology is based on a reversible refrigeration circuit for which all the components of the system are designed. In cooling mode, the heat from the interior of the bus is absorbed via the low pressure, low temperature liquid refrigerant in the evaporator. After compression, the heat from the refrigerant is dissipated to the ambient air by the condenser and the refrigerant is condensed. The refrigerant is then passed through an expansion valve (where its temperature and pressure are reduced) and into the evaporator where the cycle is completed. During heating, the cycle operates in the opposite direction, with the evaporator acting as a condenser and the condenser as an evaporator. 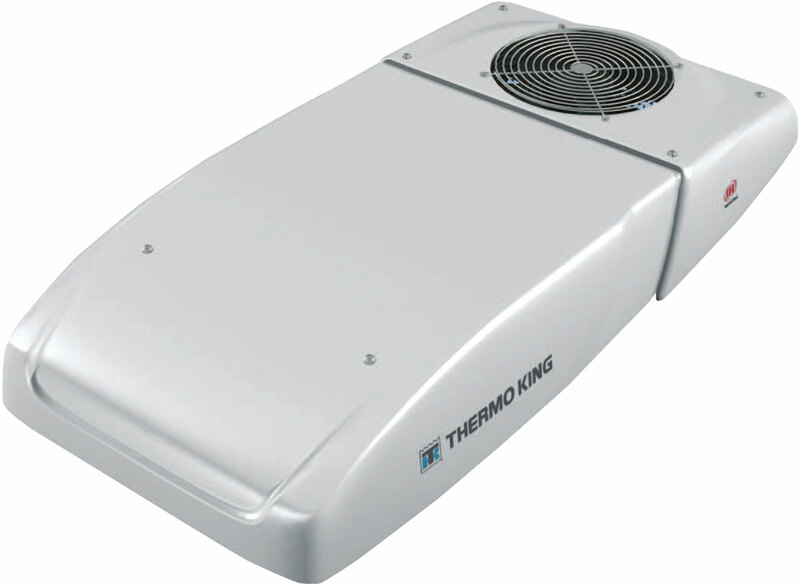 Grayson Thermal Systems is the UK Master Dealer for Thermo King’s range of air conditioning products. The company can offer complete products, parts and service for these systems. In addition to this, it can also carry out work on other air conditioning system brands. It supplies all of the UK’s PCV OEMs and has a network of engineers across the country to provide installation, routine maintenance and repair services. Area Sales Manager, Coleen Williams, said one of the company’s best selling products to the bus and coach industry is the SR-10E. The driver cab air conditioning unit is hermetically sealed to help keep it working at an optimum level. It comes with a five year parts warranty. Air moving applications is how SPAL describes its range, highlighting that they would be ideal and reliable for coping in the recent desert dust and pollution clouds afflicting the country. With over 3,000 products in its portfolio, SPAL claims its centrifugal blowers come to the fore when environmental problems arise and when the weather begins to hot up. Its products provide cabin cooling and through flow of air to remove pollen, dust and other irritants to keep the atmosphere fresh. The blowers are available with ‘Long Life’ motors, which, the company claims, are able to give up to 10,000 hours life before requiring replacement. They are also built for endurance and are designed to be completely weatherproof. Tested to IP68 standards, these LL motors are contained in sealed units designed to keep out all the elements. Clayton Climate Control manufactures a variety of air conditioning and heating products for retrofit and OE, including standard and air blown convector heating to joint air conditioning and heating demister boxes. It supplies individual components and spare parts, supporting a variety of brands including Sütrak (Eberspächer), Thermo King, Heavac, Hispacold and its own make. Customised service packages are available from the company, ranging from yearly services with a 12 month warranty to quarterly preventative maintenance inspections and repairs. It has been involved in the industry since the 1920s, supplying, installing and manufacturing climate control equipment.